In ancient times the local people built many of these bridges for daily travel, using vines that grow wild in the mountains, yet only a few vine bridges still remain today. Looking down while crossing is enough to put butterflies in any visitor's stomach. 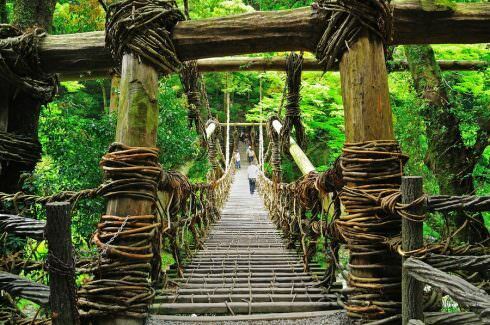 Recognized as one of three kinds of unusual bridges in Japan, they are designated as an important folkloric property. Take the Shikoku Kotsu Bus "Kazurabashi-iki (for Kazurabashi)" at JR Oboke Sta. (approx. 20 mins). Get off at the bus stop "Kazurabashi" then walk for 5 minutes.